Shelley Cardiel "rescued" three old photographs belonging to the PLAIN Family of Illinois and Indiana. The first photograph is one of George PLAIN of Atlanta, IN which was taken at the Wolever Studio in Lafayette, IN. This first photograph was taken in the 1890s with George likely about 7 years old at the time it was taken. 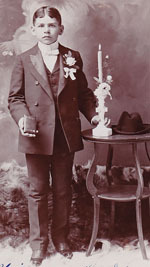 It appears to be a first communion photograph. The second photograph is one of Lena PLAIN REIS and Mary PLAIN FISCHER which was taken at the Fleischer Studio in Streator, IL. 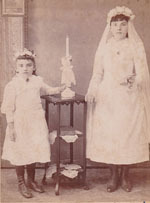 The second photograph is also a first communion photograph with Lena likely about 5 years old and Mary appearing to be about 7 years old at the time. 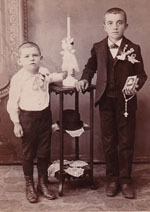 The third photograph is not identified, but is a photograph taken at the same Fleischer Studio in Streator or two young boys during first communion. It appears that all are children of Nicholas PLAIN (1847-1903) and Rosa BAUER (b. 1862). The couple had a total of 11 children including Mary; Anna; Nicholas; Lena; George; Lottie; Carl Bine; John; Satta; Bryan C.; and John Phenis PLAIN, all born between 1879 and 1900. George G. PLAIN was b. 1885 and d. 1909 and is buried in the Cicero Cemetery in Cicero, IN. Mary Rose PLAIN was b. Jul 1879 in Kansas, married John M. FISCHER (1873-1957) on 4 Feb 1902 in Tippecanoe Co., IN and she died in Logansport, IN on 19 May 1962.